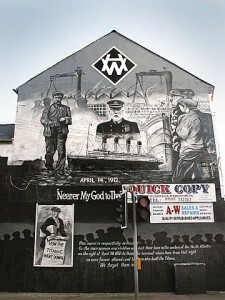 Titanic mural at Newtownards Road and Dee Street in Belfast, NI. With summer now in the rear view mirror, autumn is coming up soon. Many stores have already put out Halloween candy and a few costumes. One grocery store nearby has started making pumpkin pies and put out whole pumpkins for sale. But who puts out pumpkins in September? No one that I know of. A few commercials with Halloween themes are starting to appear as well. And of course we are starting to see just the usual beginnings of “true” ghost stories starting to appear. Autumn is usually the transition from Summer towards Winter. The days get shorter and the nights longer. Temperatures start to drop in most areas but not always. The San Francisco Bay Area usually has its long awaited summer. Most of the year the temperatures along the coast are in the 60’s to low 70’s Fahrenheit and often cooler due to the marine layer. But in September and October, heat arrives from the interior. The wind shifts to off shore and temperatures usually soar sometimes with record breaking days. Usually it lasts just a few days at a stretch but it can be quite miserable with all the concrete radiating heat in downtown Oakland, San Francisco, and San Jose. Most homes do not have air conditioning. We wait anxiously for the fog to return and rejoice when it brings the cooling we so desperately want. But it creates spectacularly bright days which is great for sightseeing. Beaches that normally are only visited by people walking their dogs or surfers become popular spots. Just remember that sand can be hot as well! Of course the big news for Titanic buffs is the bankruptcy of Premier Exhibitions and the impending sale of the artifacts. The best news would be for the collection to stay in the U.S. or Britain conserved by a museum (or group of them). Hard to see how it will play out but the big money is on the Chinese to purchase it. Of course they will swear up and down they will keep it all together and in the court’s jurisdiction. I suspect though that little by little it will go over to that new theme park in China where a Titanic replica is being built. What Clive Palmer could not pull off they are doing quite handily. From all accounts, it will be quite a sight to behold. Going over to You Tube you will find all kinds of videos about Titanic. Some are trailers or clips from the various Titanic movies. Others purport to present shocking new evidence of how it really sank. Some of the more reliable ones are from reputable sources like the History Channel, BBC and others. Then sometimes you come across one that makes you stop and enjoy. My Heart Will Go On has become an international standard from that movie and for Celine Dion her most famous song. Here is a lovely rendition of that song on a violin. Some months back there was a news report about a new study on icebergs. 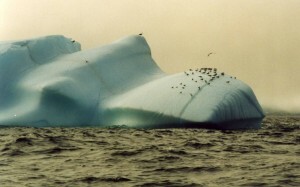 It revealed that 1912 was an exceptional year for icebergs with higher than average numbers of them about in the North Atlantic. That study has now been formalized in a paper titled The Titanic Year of 1912: Was It Exceptional? by Gary Bigg in Significance magazine. But the story is not just about 1912 but also a warning that iceberg risk is about to increase, so they are still a great threat to ships. No further comment except to say I hope tax dollars were not used in this study. Most people who hear My Heart Will Go On usually like it but occasionally someone gets the needle stuck in their head. Not only does the music play but causes attachments to form. Perhaps ones that are completely wrong. Like Ashley Formby, age 27, in the U.K. He is or was an aspiring singer and his teacher, Helen Sedgwick (age 27), taught him that song. And then it went bad reports the Mail Online. He messaged her stating he wanted to be more than a music student. He followed up with flowers, emails, and gifts. She apparently shunned his advances but to no avail. She got a harassment notice (the U.K. version I assume of a restraining order) but he still continued to attempt contacting her via emails. So it finally ended in his arrest for violating the harassment order and the contacts ceased. And a judge now has made the restraining order indefinite. My iPhone decided recently that I ought not hear calls anymore. I could listen to them via the speaker (or talk) but that was a nuisance. My first clue was getting a call and thinking there was dead air. It frustrated a relative of mine thinking I was pranking them! I followed all the recommend procedures suggested by Apple and others to no avail. So I had to head to an Apple Store and let a tech figure it out. I went to the Apple Store in Burlingame, California. In retrospect, another place probably would have been better. Downtown Burlingame on historic Burlingame Avenue is always an experience but midday when it is warm and sunny means lots of people are about. It is a day the Beach Boys would sing about. Lots of pretty girls, young mothers with strollers, parents with kids are about. The store itself was pleasantly cool but when I entered it was like being in a noisy restaurant. Now the staff was very pleasant and I was on time for my appointment. And the guy that assisted me did a great job. Thankfully my iPhone is still under warranty (and with AppleCare+). The receiver was shot so they gave me a new phone. Could not have been nicer and easier to deal with. I asked him though if it was always this noisy at lunch time. He smiled and said yes. I said my voice was going hoarse from having to talk louder than normal. He laughed and understood exactly what I said. But heading back home I could hear The Beach Boys singing a song about sunny days and happy people strolling down the street near a beach. Burlingame is not near a beach but it can be as close as your imagination. The Huffington Post reported earlier this week on the shutdown and said it was at the Atlanta exhibition. They claimed to have spoken to someone in the ticket office that confirmed it had been closed for less than a day and water damage not serious. However NBC Nightly News ran a report that night saying the exhibit involved was the Luxor in Las Vegas. So which one is correct? Only the mummy knows for sure. 2. Celine Dion revealed in an interview that she initially did not want to sing “My Heart Will Go On” and did not like it much. She only made one recording of it, a demo, that was used in the movie and on the soundtrack. Of course she adds she has sung it “three million times after that live.” Although she has had many other hits, the song has been identified with her. But she has one request: not to play it at her funeral. 3. Thomas Zaller, a former employee of Premiere Exhibitions that currently runs Titanic:The Artifact Exhibition, is being sued alleging he used protected information and some of Premiere’s materials to create a copy of its exhibition in Macau, China. “Premiere said Zaller used underwater videos owned by Premier and photos of Premier’s Singapore exhibition to promote its competing exhibition on the Internet, in the media and at trade shows in the United States.” Zaller sought dismissal of the suit against him and his companies claiming the federal court lacked jurisdiction and not the right venue. U.S. District Judge William Duffey Jr. ruled that the court had jurisdiction over the trademark infringement claims against Zaller and the U.S. entities, but dismissed Zaller’s Singapore-based company as a defendant, finding that it had acted outside the United States and had no interaction with U.S. consumers,” reported Courthouse News Service. BuzzFeed has an interesting post titled “7 Songs About The Titanic That Aren’t “My Heart Will Go On.” It is a compilation of covers for sheet music dedicated to Titanic that came out after the disaster in 1912. Some really neat looking covers. One in particular is My Sweetheart Went Down With The Ship–A Beautiful Song Inspired by the Wreck of the Titanic. 10. Faith Hill – There You’ll Be, Pearl Harbor. Just proves some songs are enjoyed long after the movie it was in has departed the theatre. I am not surprised to see Circle of Life on the list but surprised to see Summer Nights from Grease. Olivia still has appeal after many years since that movie came out. Too bad a song from West Side Story did not make it. Some do not like Celine Dion’s song but, despite the critics, it still tops the list year after year. Buy the [amazonify]B0000029YC::text::::Titanic soundtrack[/amazonify] today!